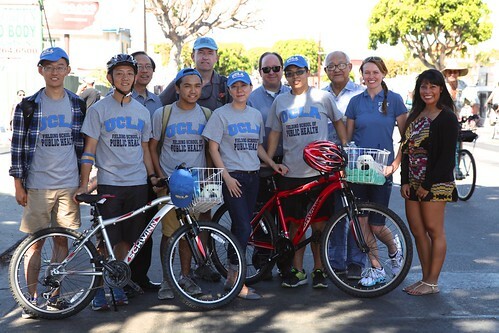 The UCLA Fielding School of Public Health has long been involved with CicLAvia. A study by the UCLA Fielding School of Public Health has found that the event significantly reduces air pollution along the CicLAvia route and even on other streets in the communities where the event is held. LOS ANGELES – CicLAvia concluded its most ambitious year ever yesterday by revealing the results of nearly two years of studies conducted by UCLA and the RAND Corporation examining CicLAvia’s impact in a number of areas. The studies examined the demographics of CicLAvia, the social impact the event has, the public health benefits offered by open streets events, how business benefit from CicLAvia, and the positive changes in air quality with cars removed from the streets for a few hours on a Sunday. The studies cover seven CicLAvia events from April 2014 through August 2105 (an additional business study was conducted in April 2013). The studies were conducted by the UCLA Fielding School of Public Health, the UCLA Luskin School of Public Affairs and RAND Corporation. They include participant surveys, business surveys and air quality monitoring. The participant study was conducted by UCLA with design input from RAND Corporation and CicLAvia. The goals of the study were to determine geographic location of participants, diversity of participants, reasons for attending CicLAvia, general activity tendencies, attitudes toward open streets events, and indicators for mobility change. The study found that CicLAvia participants are diverse, highly local to each route, yet still well traveled from throughout the region, a mixture of families and individuals, and many participants experience CicLAvia for the first time with each new route. Participants nearly mirror LA County’s ethnicity demographic percentages, representing all age ranges. People from 74% of zip codes in the City of LA attended all 2015 events. These 74% of zip codes represent 80% of the population of the City. People from 51% of zip codes in LA County attended all 2015 events. These 51% percent of zip codes represent 58% of the population of the County. Participants travel on average 15 miles from home to CicLAvia. About half of participants come from ten or fewer miles away. Nearly 25% of participants bring kids. Every route has a different audience, with 40% new attendees at each CicLAvia. First time participation is higher among women than men (34% to %28%). Each event in 2015 drew the highest number of participants from zip codes adjacent to the route. Taken together, we see how these events allow people from the entire region to experience their streets in an entirely new way. CicLAvia is perceived by some to be a “bike” event, but the studies show participants tend to be “average” Angelenos rather than bicycling devotees. However, the benefits of open streets for Los Angeles transportation infrastructure are widely appreciated, no matter the participant background. Half of those surveyed bike once a month or rarely. Half of the participants arrived by means other than car (bike, walk/skate, Metro). More than 90% of participants would like a CicLAvia in their own neighborhood. Nearly 50% would like a monthly CicLAvia. 25% of participants see CicLAvia as a way to improve walking and biking conditions in LA. One of the most encouraging data sets from CicLAvia is the influence the event has on public health. While further studies are needed to see if there is a lasting influence on personal health choices based upon an individual’s CicLAvia experience, the impact on CicLAvia day is significant. There are five times more people using a CicLAvia route’s temporary park space than are using all of the other parks in the City of Los Angeles combined. Participants expend 30 times more energy than the average energy a person expends at a park. More than 40% of participants would be at home if not for CicLAvia. More than 50% would be inactive if not for CicLAvia. The top five zip codes CicLAvia draws participants from all exceed the LA County average for obesity, being overweight, diabetes and depression. In other words, CicLAvia gives people a healthy activity option they may not otherwise have. As one might expect, air quality improves compared to a typical Sunday when cars are removed from a CicLAvia route. However, the air quality study also found improvements off the route, where vehicles were still allowed to drive. Ultrafine particles are reduced by 21% on the route. These particles are linked to respiratory and cardiovascular disease. Particulate matter measuring 2.5 micrometers or smaller was reduced by 49% on the route. These particles are also linked to respiratory and cardiac disease, as well as lung cancer and premature death. Particulate matter was reduced by 12% on streets surrounding CicLAvia – streets that are still open to cars. CicLAvia’s business studies measure the impact CicLAvia has on businesses along the route the day of the event. The studies provide insight into the types of businesses CicLAvia participants frequent during an event, and how those businesses and other businesses can attract the attention of participants. Eventually, CicLAvia would like to obtain funding to learn if customer activity for service businesses (salons, oil change shops, etc.) is shifted to days other than CicLAvia (as we suspect). Additionally, CicLAvia would like to be able to learn about people returning to businesses along a route. There is anecdotal evidence from participants and business owners that participants return to stores they first discovered at CicLAvia, but firm data studies still need to be conducted. Restaurants along the route see an average 23% increase on CicLAvia days, as compared to the previous Sunday. This is a particularly interesting finding because there are usually about 30 food trucks at each event. Even given more food options, restaurants see this increase (2013-2015). Businesses who actively engage with the event by bringing their business out to the street or offer special advertised CicLAvia promotions, experience a 36% increase, on average, compared to the previous Sunday (2014-2015). CicLAvia has always seemed like a safe and crime-free event, but a recent UCLA analysis of crime data along routes from 2014, looking up to a quarter mile out from each route, has given firm numbers to back up that assumption. Despite an influx of tens of thousands of people into a CicLAvia route neighborhood, there is no change in property crime compared to non-CicLAvia Sundays. In fact, there have only been two reported stolen bicycles at all CicLAvias, and those both occurred off-route. Violent crime drops 40% in areas adjacent to CicLAvia routes compared non-event Sundays. CicLAvia catalyzes vibrant public spaces, active transportation and good health through car-free streets. CicLAvia engages with people to transform our relationship with our communities and with each other. With the full support of Metro, local governments, Los Angeles Mayor Eric Garcetti, the Los Angeles City Council, Police Department, Fire Department, Department of Transportation, the Department of Water and Power, and the Department of Parks and Recreation, CicLAvia is an innovative model for creating new public space and enriching civic life. CicLAvia is a 501 (c) 3 nonprofit organization. Partners include Metro, the City of Los Angeles, the Wasserman Foundation and an Anonymous benefactor. Supporters include the Annenberg Foundation, Ralph M. Parsons Foundation, Rosenthal Family Foundation, Los Angeles County Department of Public Health, Durfee Foundation and LA 2050. Sponsors include Los Angeles County Department of Water and Power, David Bohnett Foundation, Roth Family Foundation, Southern California Gas Company and the Laemmle Charitable Foundation.